The Search Engine Results Page, or SERP, is the page where listings of results based on a keyword or search query appear. The SERP looks simple enough to the searcher, but it is much more complicated behind the scenes. The very top shows the search box and the search query used for this example (‘washington va inn inn’). As you can see, the top section of the listings is normally dedicated to paid search ads (as long as there are advertisers bidding on the search query you typed). Depending on how many advertisers are bidding on the particular keyword, more paid search ads might appear on the right hand side of the page. 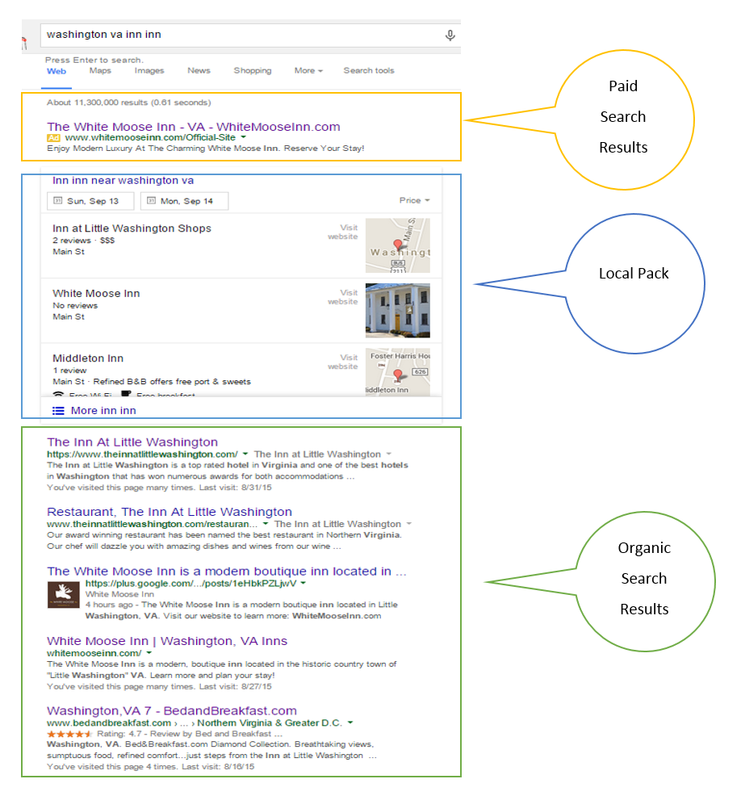 Right below the paid search ads section is the local pack, which are local results relevant to the search query. The information displayed on the local pack comes from each hotel’s Google My Business page, once more showing us the importance of a sound local SEO strategy for your hotel. Below the local pack are the highly coveted organic search listings. These are the listings that show up based on millions of websites being crawled and Google deciding which is the most relevant to the search query. Whether or not your hotel shows on the top organic listings depends on your hotel’s SEO efforts. Area you ready to generate more direct bookings? Contact us today to learn more and get started!